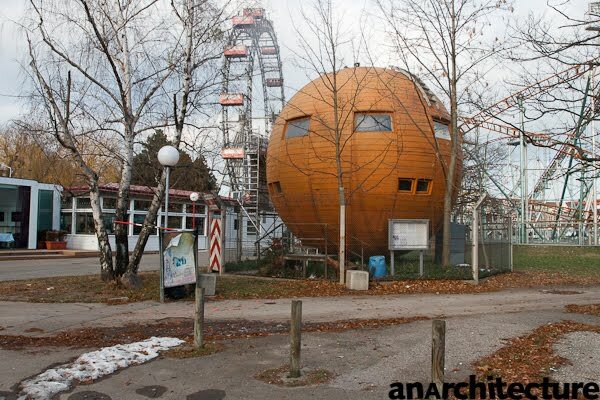 Kugelmugel ("sphere-hill") is a “micro-nation” situated In the Vienna Prater, erected by the artist Edwin Lipburger. The nation has got 611 citizens and even its own stamps (which brought him almost to jail). Edwin Lipburger argued that a spherical building has got its own centre point - independent from the geocentre - and therefore Kugelmugel is free from laws and (building) regulations. So far, however, the building has neither water connection nor electricity. Of course the “micro-nation” was never confirmed (more information at croynielsen.de).